What happens when traits no longer give creatures a competitive edge? Some subterranean animals that live in darkness function perfectly well without eyesight, for example. And the tiny leg bones buried in the backs of whales — left over from their land-dwelling ancestors — don't get much action in the ocean. In a recent review, researchers teamed up to take a closer look at the evolutionary fate of useless traits. Supported by the National Evolutionary Synthesis Center (NESCent) in Durham, NC, their aim was to examine what happens to traits that are no longer needed. "Just about everybody who thinks about trait evolution focuses on traits that are beneficial," writes first author David Lahti, a biologist at Queens College. "But few people think about traits that are useless, or that are becoming less useful over time." For example, the ability to recognize and flee from enemies becomes less critical in predator-free habitats. "There are many examples of animals that were once subject to predation, but have since been introduced to areas where predators are absent or have been killed off," Lahti says. In these cases, studies show that traits which were once key to survival - vigilance, caution, speed and agility - start to erode over time. "Things like alertness, having to run fast, having to fly — many predator avoidance traits end up being useless to those animals," Lahti says. Under an evolutionary phenomenon called relaxed selection, traits that were advantageous in one time and place become obsolete in another. Traits that aren't actively maintained by natural selection tend to become smaller or less functional over time, studies suggest. The researchers wanted to know why some traits break down quickly, while others take longer to go away. "All traits will eventually disappear if they have no function," Lahti explains. "The question we're asking now is: how do you know how fast that will happen?" To answer this question, the researchers scoured the literature for examples of relaxed selection. After reviewing more than 80 studies spanning nearly 150 years of research, they pinpointed several factors that determine how quickly traits are lost. "Numerous cases of trait loss illustrate that evolution isn't necessarily progressive," says co-author Norman Johnson of the University of Massachusetts. "It seems that not all the same evolutionary rules are followed when you're losing a trait as when you're gaining it," Lahti adds. Traits that are energetically expensive to develop or maintain tend to be phased out more quickly, they found. The threespine stickleback, for instance, is a little fish that evolved body armor to help protect itself from predators. Sticklebacks require a lot of energy and minerals to build armor, Lahti explains. When these fish are introduced to predator-free lakes where their bony plates aren't needed anymore, individuals that avoid wasting valuable energy on useless armor fare better over time. The result? Populations that are safe from predators lose their armor over the generations. "The biggest reason why a trait goes away quickly is because it's costly," Lahti says. Rapid trait loss is also more likely when it involves relatively simple genetic changes, studies reveal. For example, many cave-dwelling creatures such as crickets and cavefish lose their eyesight as they adapt to life in the dark. "Until very recently, we didn't know anything about the genetics or development of eyes in cave fish," Lahti explains. "People assumed it happened in successive small steps, over a long period of time." But recent research on the genetics of eye development in these animals suggests that a small number of genes play a big role in blindness. "Until modern genetic techniques we never would have guessed that these big changes in the eyes could happen by such minor genetic changes," Lahti says. 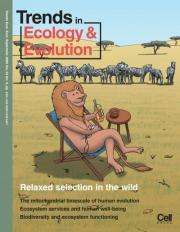 By studying relaxed selection in plants and animals in the wild, the authors hope to understand the consequences for humans as well. Advances in medicine and technology shelter humans from many sources of selection that acted in the past, Lahti explains. This might allow traits that were helpful to our ancestors to fade away over time. "Modern technology insulates us from selection in many ways," Lahti says. "It's a valid question to ask what the effects of this are likely to be." I now of cattle isolated from motor vehicle traffic. The animals have not experienced predation in generations. When an occasional pick-up truck goes by they pay it no attention. When a dog in the back of that truck starts barking they pay it no attention. Sometimes aircraft including noisy fighter jets pass low overhead they pay no attention. But when an offroad road motorcycle, even one with a quiet muffler is anywhere near they panic and often do a little stampede. Why do they fear the little motorcycle yet ignore the larger often noisy vehicles and other animals? I think it's because the motorcycle moves like a predator and even though they haven't seen a predator in generations they still know what one is.